Do you have a WordPress website and want to find the best hosting solution for it? Today, we decided to review Kinsta – one of the best WordPress website hosting solutions on the market. What differentiates Kinsta from other hosting solutions? Kinsta is powered exclusively by Google Cloud Platform. They utilize Google Cloud’s premium tier global network which means your WordPress site will load even faster than usual. Nginx, PHP 7, LXD containers and MariaDB are used in order to make your website load faster. Kinsta is also the recommended solution by Google Cloud. Great WordPress-focused support. If you’re a webmaster for some time, it probably happened to you already to need support from your hosting company and not getting the right solution for your WordPress site. Some companies are savvier when it comes to Joomla, Drupal, or other CMS types, so if you own a WordPress site you may consider hosting it with a company that knows this platform very well. The support team at Kinsta is made up of WordPress developers who also create WordPress themes, plugins and contribute back to the core. This hosting solution comes with 24/7 support is available for all their customers 365 days a year. This means there are no waiting in lines for support, you will receive your response efficiently and fast. Plus, no issues go unsolved, not even complex ones! Whether your site is getting hacked, is down for apparently unknown reasons, or anything else, the problem will have a solution ready fast. Not your traditional hosting provider. Kinsta’s infrastructure is entirely built on the Google Cloud Platform which is very different from traditional shared, VPS, or dedicated infrastructures. It utilizes LXD managed hosts and orchestrated LXC software containers for each of your sites, meaning that any WordPress site is housed in its own isolated container, with all of the software resources required to run it(Linux, Nginx, PHP, MySQL). The resources are also 100% private. High-security network. Malicious attacks are stopped in their tracks. 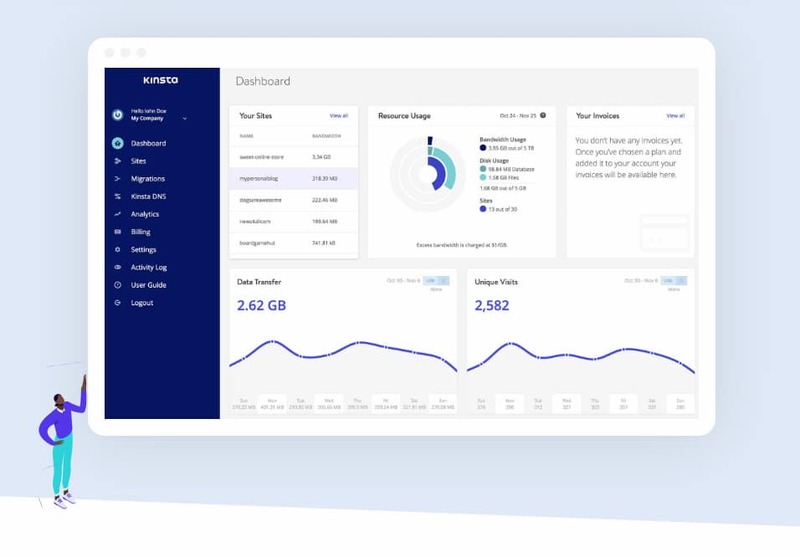 Kinsta continuously monitors the uptime and includes DDoS attack detection, malware scanning, SSL support and hardware firewalls. Uptime checks are done every minute. This means your site will be checked 1440 times a day! Any issues that may appear will be solved quickly. Full backups are done daily. If anything bad happens, you can easily reinstate a backup of your site with just a couple of clicks. You can also create additional backups every 6 hours or even every hour if your site’s content changes that fast. Free hack fix is also offered with each hosting plan. Their proactive prevention systems will assure you hacks won’t happen to your site, and if they do, or any suspicious activity is observed, they will be dealt with immediately. They have a great technicians teams with experience in restoring your site perfectly. Because their infrastructure is built upon the Google Cloud Platform, your site can automatically scale up to its needs, so don’t worry about any traffic surges, you’ll be ready to face any unpredictable sudden spikes in traffic without the server going down. With Kinsta you will stay safe and spend less time worrying about your website. User-friendly management dashboard. Managing your site is easy. Adding a new site, deploying a staging server, cloning your site or viewing analytics, and more, all can be done via an easy to use interface. You can use Cpanel or Plesk as well if you want. You can use the Kinsta dashboard to control the settings for all your sites in one place. Track bandwidth, check response times, or create SSL certificates, it can all be done with ease. If you’re a web developer, you can create development sites with just one click so you can test before pushing them to production. You can create a staging environment for every WordPress install and make it separate from your live production site. Test updates, plugins, code, and more, and only when it’s ready and bug-free you can push the staging to live. All can be done in a matter of seconds. 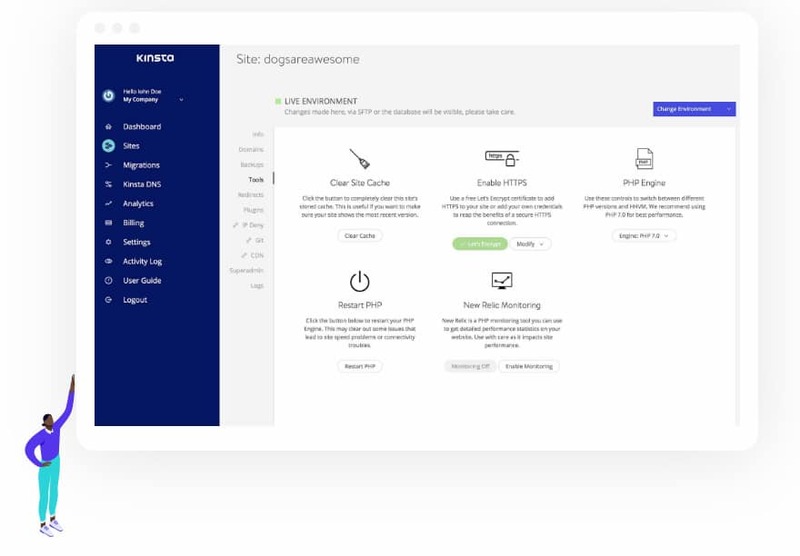 You don’t need to have any coding knowledge to use Kinsta for hosting your WordPress site, but if you’re a web designer or web developer, you’re also covered! This hosting solution was built by developers for developers. It comes integrated with tools and software such as WP-CLI, SSH, and Git. Plus, it’s easy to change PHP versions. PHP 5.6, 7, 7.1, and 7.2 can be enabled with a single-click. Free CDN, free Letsencrypt SSL, staging environments, automatic daily backups and the option to create manual backup points. Full page caching at the server-level to deliver content almost instantaneously to visitors. Server-level rules and optimizations for WooCommerce and Easy Digital Download sites that ensure a smooth checkout experience for customers. The pro and higher plans come with a free migration, so you don’t need any tech skills at all. The business and higher plans also include SSH and WP-CLI access for developers. Cloudflare Railgun. Established a fast connection between your origin server and the Cloudflare network. Elasticsearch. Offers a RESTful search and analytics engine that is capable of solving a growing number of use cases. Redis. This is an open source, in-memory data structure store, that is used as a database, cache and message broker. Nginx reverse proxy. Lets you load WordPress from a subdirectory while a separate website loads at the root domain.